Please lock and close this topic, sorry for all the trouble, reason to lock, new project. What exactly are you including in this pack? Is this an addon to OF:R or just a small addon to tbe existing HD pack? If you'd like I can make some sprites for ya. Im editing all the sounds and all the original crappy models of OP4 and adding them all ragdoll alike animations and reskinning them and remodelling all the equipment and facial texture and body textures, for the sprite what can you do? As far as sprites go I've been working on a HUD for my own personal use in OF, but when finished I will release if you want. I replaced the 640_train, released, check the 2D section. I haven't worked with other sprites as much, but name it and I will try. 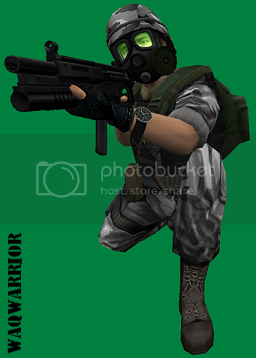 I'll make all the weapon sprites, and use the mp5 for ya. Also can do crosshairs. Blood is a decal, I'll see what I can do. The HUD will have scan lines still, like defaults. I'll see if I can do a few HUD concepts if you need some. Alright il need all the help i can get thanks alot, if i can actually get all this done i might do an alternative Version of OP4 Il edit all the mapping. Here a new pic of a drill instructor im making, its really not that simple haha i did a lot of improvement on him but he still seems a bit unfinished because the proportions are still not accurate. What do you guys prefer? Helmet or No Helmet? I prefer no met for normalOp4grunt. Give him the DI hat. I don't believe a beret is acceptable for a drill instructor on duty. Good job, i tested the huds what else are able to do? do u have other skills?